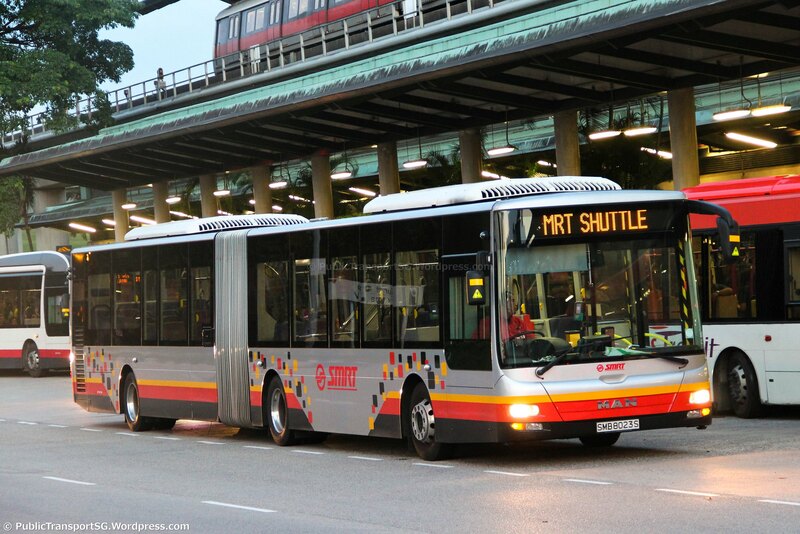 Rail Bridging Services (also called MRT/LRT shuttle buses) are shuttle bus services which are provided in the event of a rail disruption. 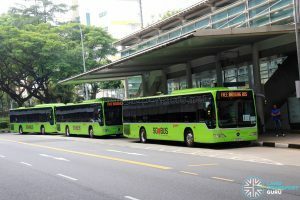 When a section of the rail network is suspended, these buses would ferry affected commuters between affected stations, hence minimising the impact of rail disruptions on commuters. Rail bridging services are a necessary part of rail operations in the event of a service disruption. 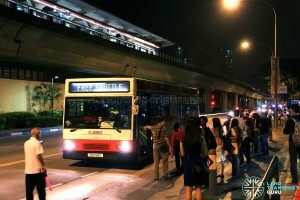 Due to the high density of urban rail lines, existing modes of public transport are usually unable to cope with the surge of stranded commuters. 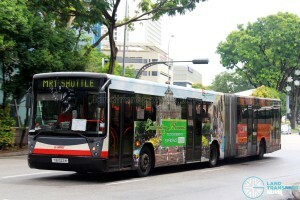 As such, rail operators are obliged to arrange for shuttle buses that ferry commuters between affected stations. 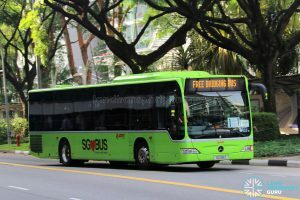 Due to the multi-modal nature of local Public Transport Operators (PTOs) SBS Transit and SMRT, either operator is responsible for the organisation of bus bridging services when their network is affected. As part of the Bus Contracting Model (BCM) contract terms, bus operators are required to familiarise drivers on Rail Bridging service routes along rail lines within their catchment area, and deploy resources in the event of a train disruption. 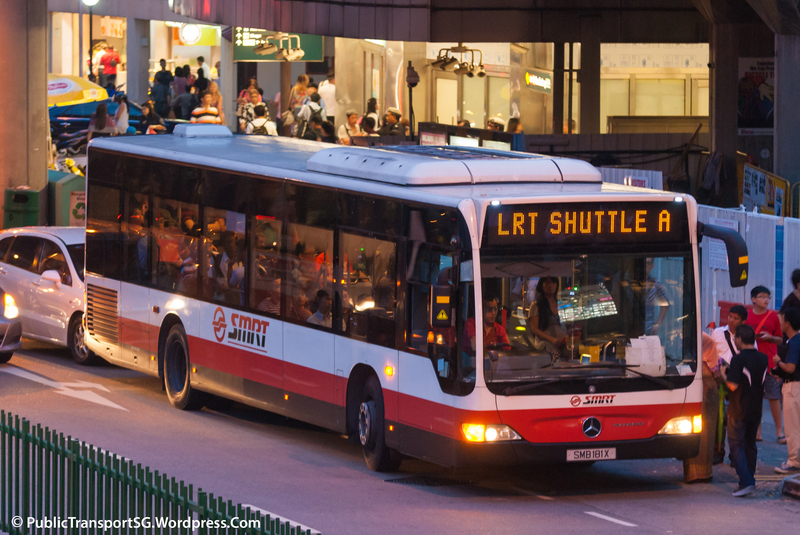 In the past, LTA required PTOs to activate rail bridging services when rail services are expected to be suspended for over an hour. 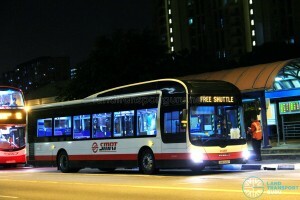 In recent years, buses have been activated at the onset of a disruption and the first buses arrive at affected stations within half an hour after the start of a disruption. 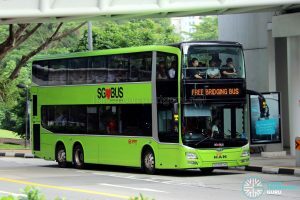 In response to a disruption, buses plying nearby bus routes can be taken out of revenue service to be quickly deployed on the rail bridging service. 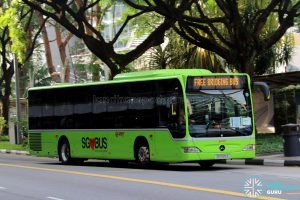 Subsequently, more buses can be sent from nearby bus depots (or redeployed from other bus services) to supplement the buses already running on the shuttle. Restrictions on buses deployed to rail bridging shuttles are usually dependent on surrounding roads. 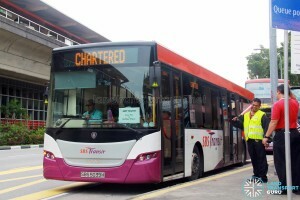 SBS Transit has not deployed double-deck buses on shuttle routes yet, possibly due to the risk of low headroom when plying certain roads along the route. 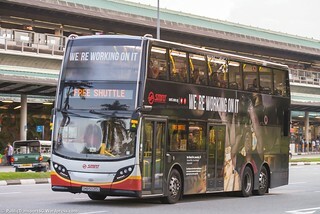 SMRT frequently deploys articulated buses on its shuttle routes and has deployed double-deck buses during North South Line and Bukit Panjang LRT disruptions. 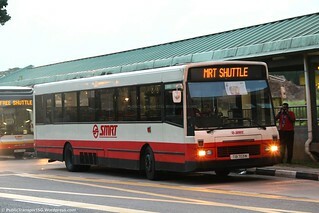 Rail bridging shuttles do not have a fixed route; they simply call at affected stations along the rail network. 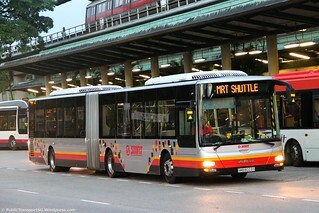 However, PTOs do train their drivers for emergency shuttle routes and may provide route diagrams for bus drivers to follow. 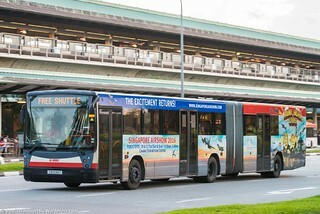 Every station on the rail network has designated bus stops where commuters can board the shuttle buses and continue their journey. 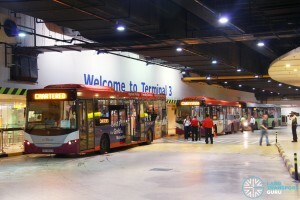 Directions to these bus stops are pasted prominently within train stations. 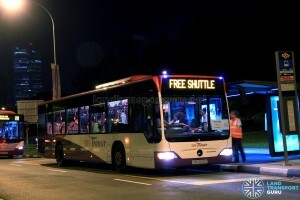 Certain bus interchanges near MRT/LRT stations have dedicated boarding berths for emergency shuttle services. While ordinary shuttle buses call at every station along the affected stretch of track, in October 2015, LTA announced special shuttle bus services which will be activated in addition to the usual bus bridging services and when multiple rail lines suffer a breakdown. 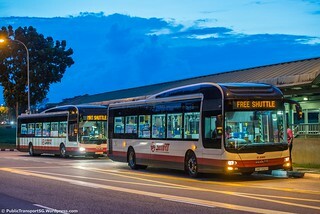 These services will ply four routes, in a loop: Jurong East-Choa Chu Kang, Buona Vista-Boon Lay, Bishan-Woodlands, and Paya Lebar-Tampines. At the onset of a disruption, regular bus services calling at affected stations are the fastest way for affected commuters to continue their journey. Should a train disruption occur, all bus services calling at an affected station offers free travel for commuters boarding at that stop, regardless of bus operator. 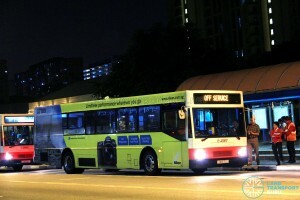 LTA has installed flashing beacons to alert bus drivers in such a scenario. 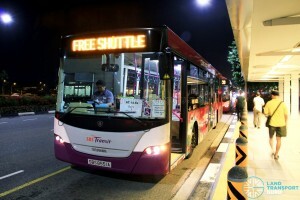 Free travel for all commuters. 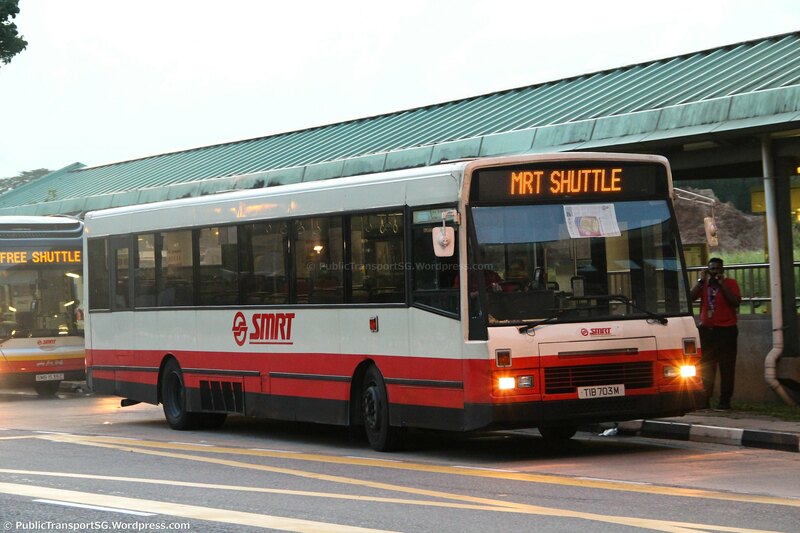 15th & 17th Dec 2011: A five-hour and seven-hour delay along the North-South Line between Marina Bay and Ang Mo Kio on both days were the worst disruptions to hit SMRT in over 20 years. 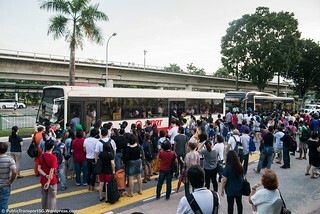 Despite the large number of buses deployed, the large-scale disruption was difficult to contain. 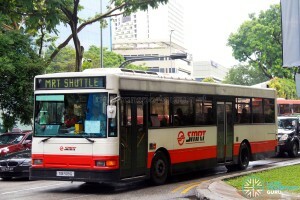 15th Mar 2012: The North-East Line between Dhoby Ghaut and HarbourFront was suspended for almost 12 hours after a fault discovered in the early hours was not resolved until 4:35pm in the afternoon. Rail bridging services were running throughout the morning and afternoon to ferry affected commuters. 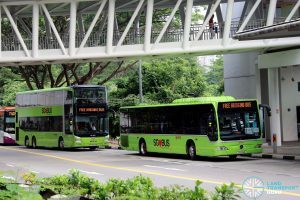 9th and 10th Mar 2015: The entire Bukit Panjang LRT was disrupted due to a tie-breaker overheating and catching fire at Senja station on 9th Mar evening. Repair works continued throughout the night and was unable to be completed by start of service the next day. Full service eventually was restored that afternoon. Rail bridging services operated from the evening of 9th Mar to the evening of 10th Mar, a few hours after service was restored. 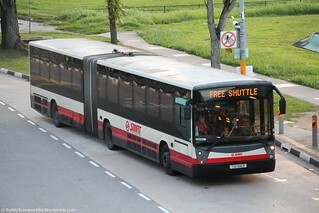 SMRT also compensated commuters and residents by allowing free travel on the BPLRT till 12 noon on 11th Mar. 12th & 19th Sep 2010: Train services were suspended on both Sundays between Jurong East and Clementi (on the East-West Line) and between Jurong East and Bukit Batok (on the North-South Line) respectively due to track modification works for the Jurong East Modification Project (JEMP). 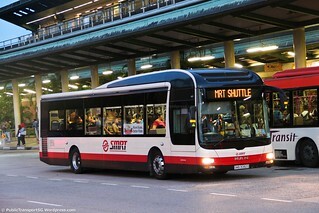 SMRT deployed large numbers of shuttle buses on both days. 18th Dec 2011: Following the major disruptions of 15th & 17th Dec, the North-South Line, East-West Line and Changi Airport Extension were suspended on Sunday morning as engineers carried out a detailed inspection of the entire train network in what was likely the largest-scale planned shutdown of the train network. 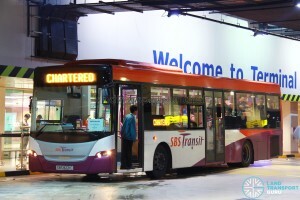 SBS Transit provided bus bridging services along the full stretch of the East-West Line, as well as the Changi Airport branch line. 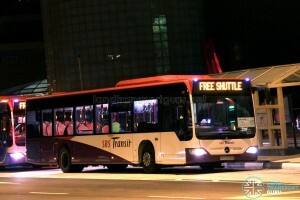 SMRT provided bus bridging services along the whole North-South Line. 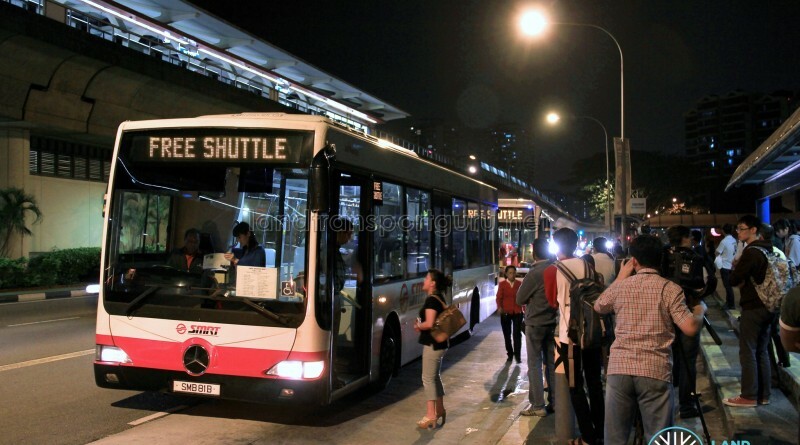 11 Jan 2014: Train service between Yew Tee and Woodlands on the North-South Line were disrupted for about two hours, leading to deployment of shuttle buses between affected stations. 22 Jan 2014: Train service between Tanah Merah and Pasir Ris on the East-West Line were disrupted for about an hour due to a trackside fault. 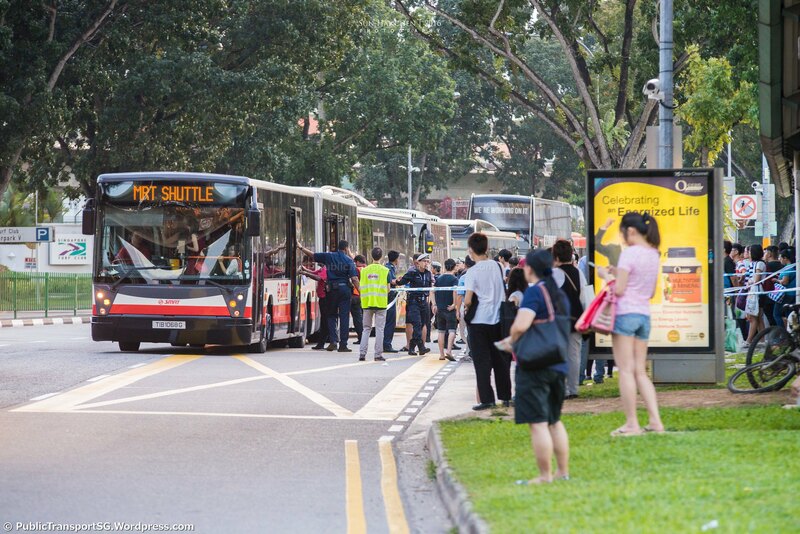 Shuttle bus deployed between affected stations but train service resumed shorter afterwards. 7 Mar 2014: A short disruption on the full stretch of the Downtown Line led to activation of shuttle buses for around half an hour of downtime. 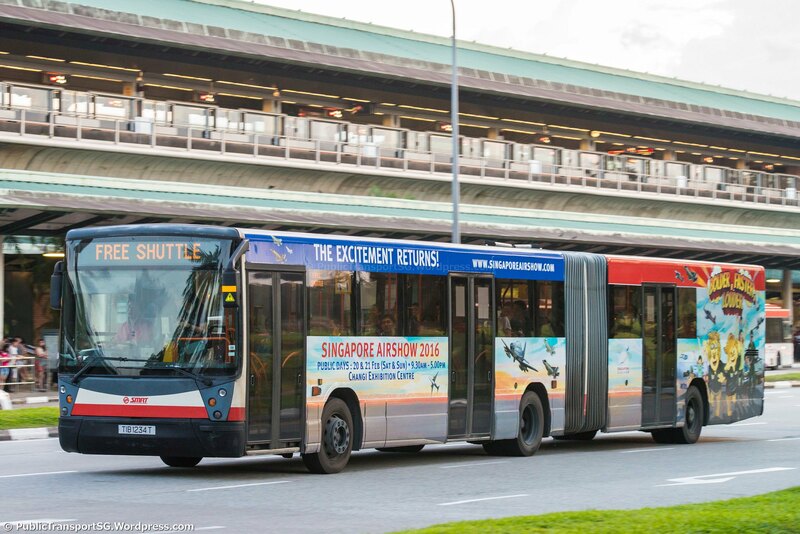 22 Mar 2014: A short disruption between Dhoby Ghaut and Sengkang on the North-East Line led to activation of shuttle buses, however most buses were withdrawn before starting on shuttle service as the fault was quickly resolved. 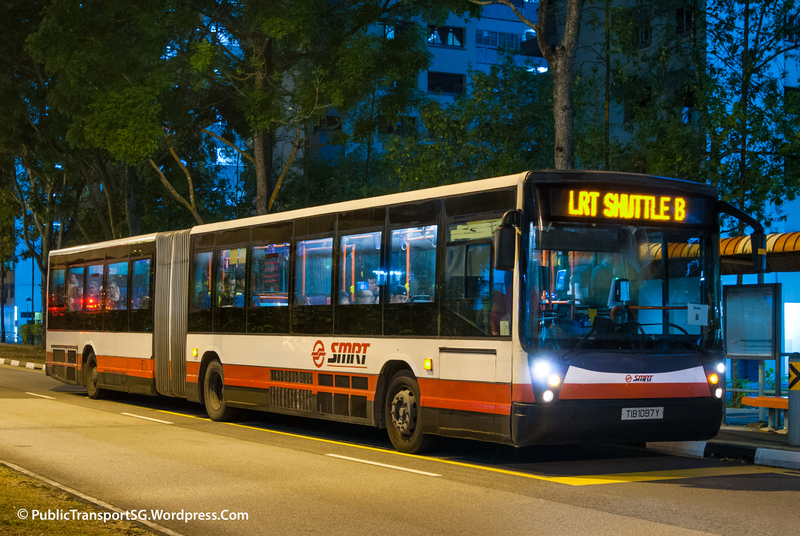 6 Apr 2014: 1.5hr Service disruption between Potong Pasir and Dhoby Ghaut along the NEL. 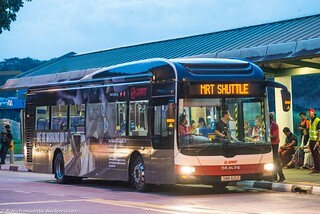 21 Aug 2014: Nine-hour disruption along the North-East Line between Sengkang and Punggol led to shuttle buses being deployed between Buangkok and Punggol. 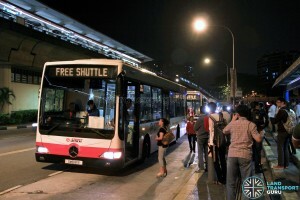 18 Feb 2015: A late-night disruption between Chinatown and Potong Pasir on the North-East Line led to activation of a small number of shuttle buses. 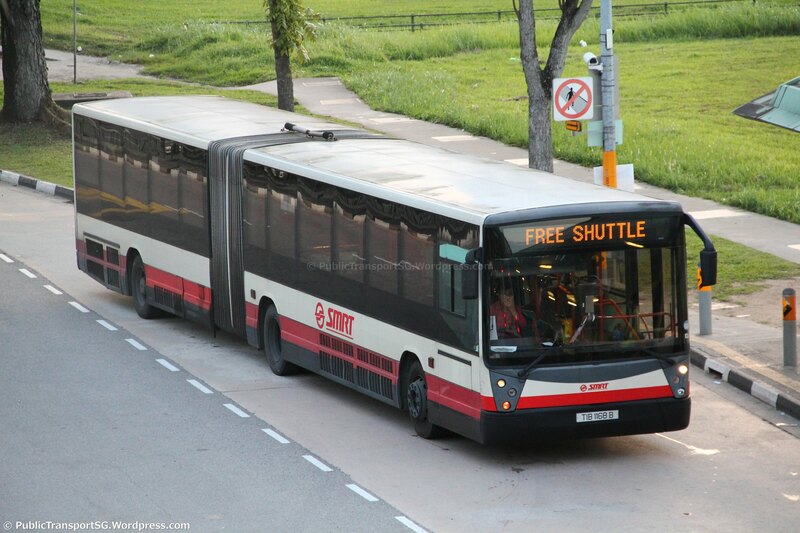 23 Feb 2015: A 3.5hr Service disruption between Yew Tee and Kranji on the North-South Line led to activation of shuttle buses deployed between Choa Chu Kang and Kranji. 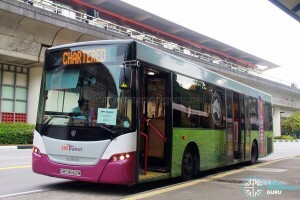 24 Feb 2015: A 1.5hr Service disruption between Choa Chu Kang and Senja on the Bukit Panjang LRT led to activation of shuttle buses. 07 Jul 2015: An evening power fault along the entire North-South and East-West lines resulted in a disruption of about three hours and affecting an estimated 250,000 commuters. The impracticality of rail bridging services to handle a diversion of such a large scale resulted in additional resources pumped into bus routes running parallel to the rail network to ease crowds. 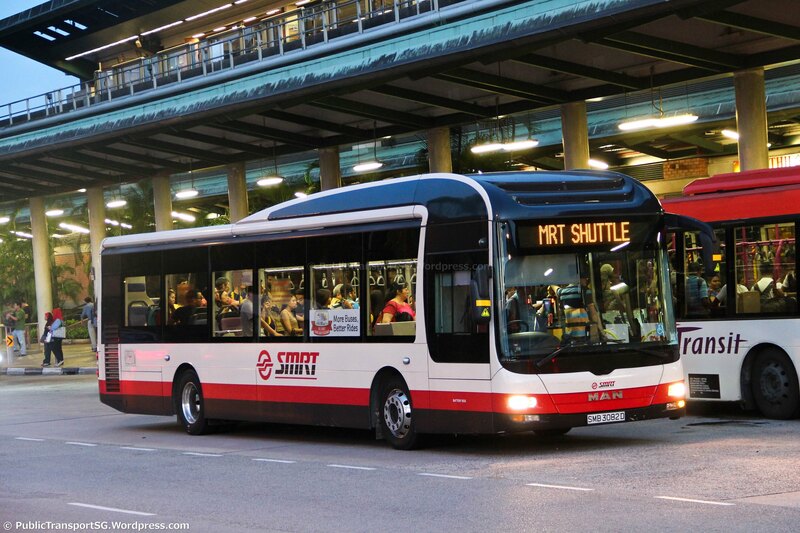 09 Jan 2016: Shuttle buses activated between Sembawang and Kranji due to an hour-long disruption between Admiralty and Kranji. 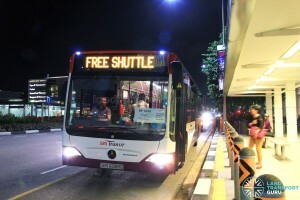 SBS Transit pulled buses from 170A to help operate free shuttle services, and SMRT deployed double-deck shuttle buses for the first time.